Happy Sunday! Today, I am taking a little break from project posts to share some fun cell phone pictures I have snapped on my morning walks with Jake this Spring. It’s been so beautiful watching it for the first time in this area. And because I am scared I will see a bear, I always carry my cell phone on my walks. At least I can call Chris and the kids and just say I love them before I get eaten. 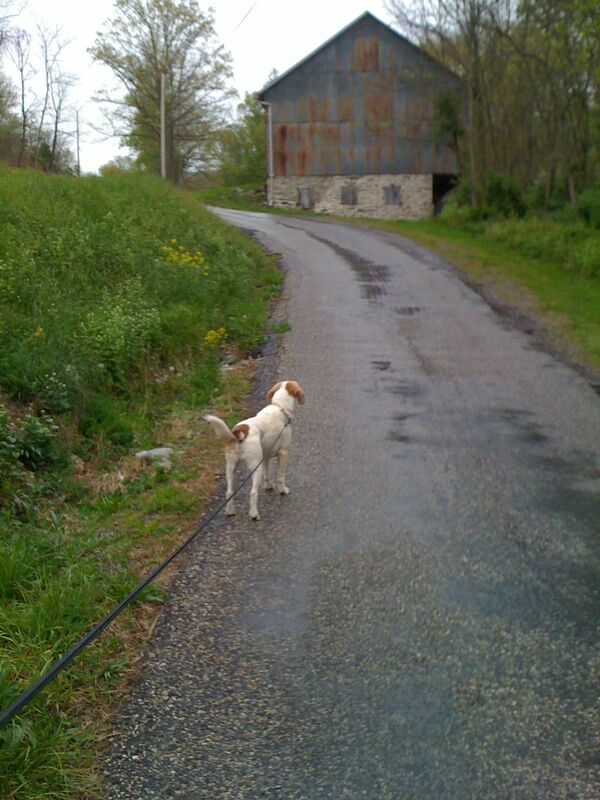 Anyhow, let’s get back to happier thoughts and scenes from our walk…. May apple- I just love these! There is something magical about them I think their flowers look like fairy hats. 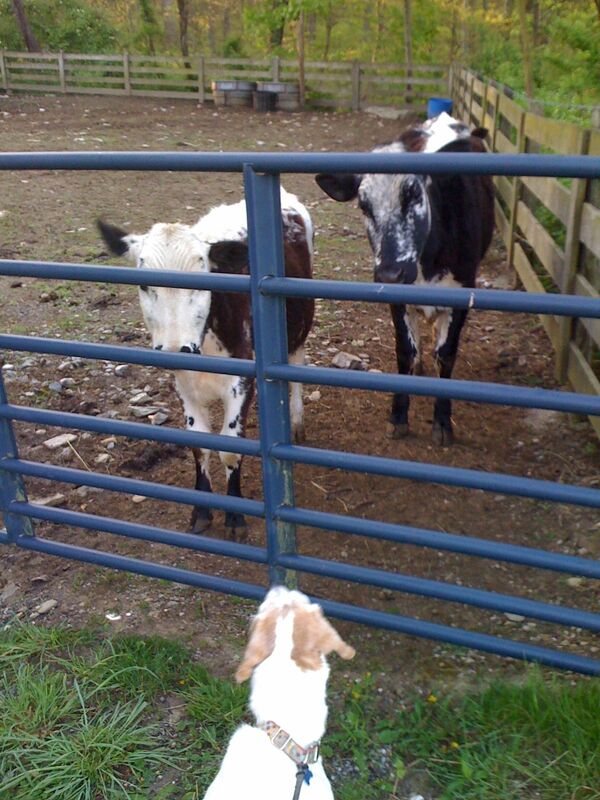 Jake greeting the calves. They moo at us sometimes, whereas the adults usually ignore us. This photo cracks me up because all the poppies are facing the wall. 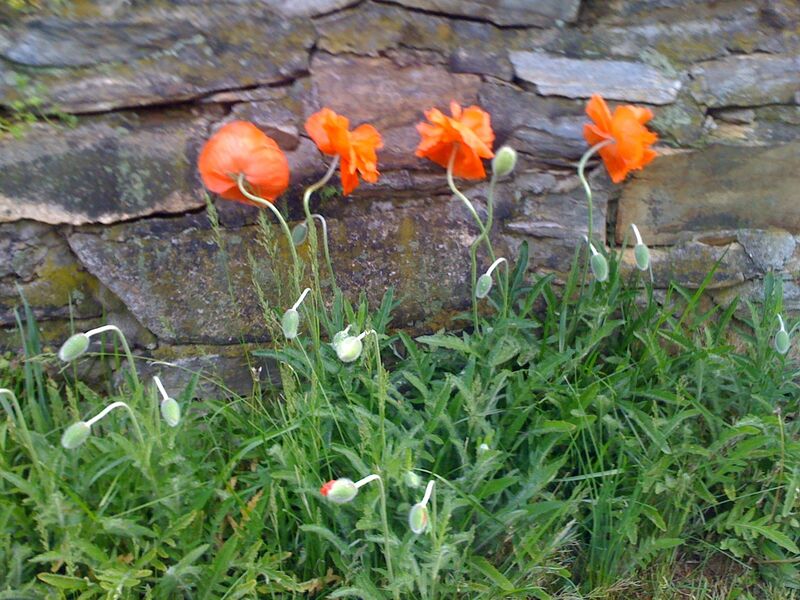 I call it “Poppies in Time Out”. 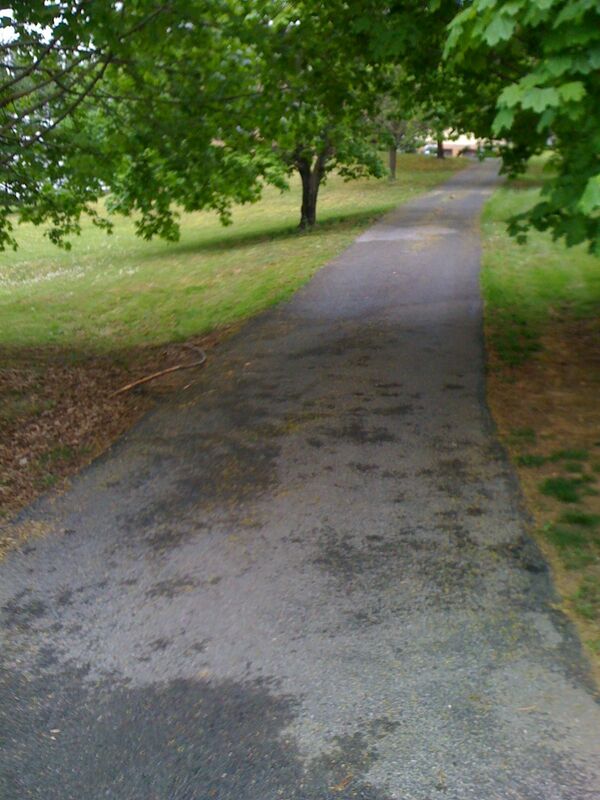 And finally, back home and up the loooong uphill driveway. Perfect way to end the walk! 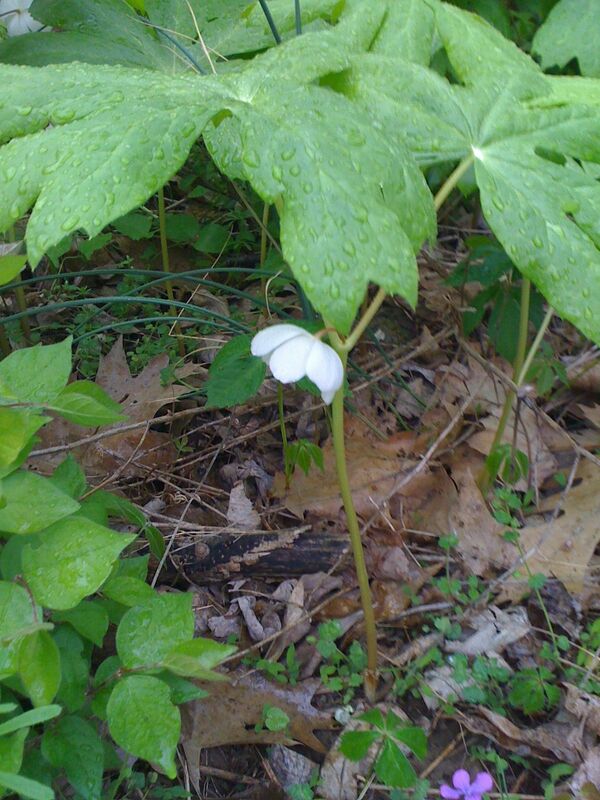 I love my morning walks when the air is fresh and Spring like, and I love seeing all the flowers bloom. Perhaps the last picture ever taken on my cell phone will look something like this…..
And now, the winner of the Blue Soul Designs giveaway…. Hi Cassie, thank you so much for stopping by my blog! I love this post. I especially enjoyed seeing the scenes from your walk. Your landscape is so different from where I live. It’s nice to get a look into the life and surroundings of people who live elsewhere. The poppy shot was too cute! i don’t even think a can of maize(?) can take care of that bear. let’s hope you don’t cross paths with anything quite this large. where do you live that you would see bears on your walks? Hahaha! “Poppies in time out.” You crack me up! Um, please don’t get eaten by a bear. I’m sure Jake would protect you and himself! You are not going to get eaten by a bear!! Something tells me you’d win the fight and your next project would involve something fur covered! A chair? A bench? The possibilities are endless. Love Poppies In Time Out!! Great photos! Especially love poppies in time out! fairy hats and poppies in time out. i love you. what a beautiful and funny post, much needed this sunday morning! Looks like a lovely walk! I grew up living in “the country” and loved the solitude and beauty of it. You have a wonderful walking buddy! That looks like such a beautiful and peaceful walk and a great way to start the day. Love the poppies and May apple. So pretty. Yes, stay away from bears please! And, thank you…just saw my name! Beautiful pictures, I love poppies! Cute how they are facing the wall! 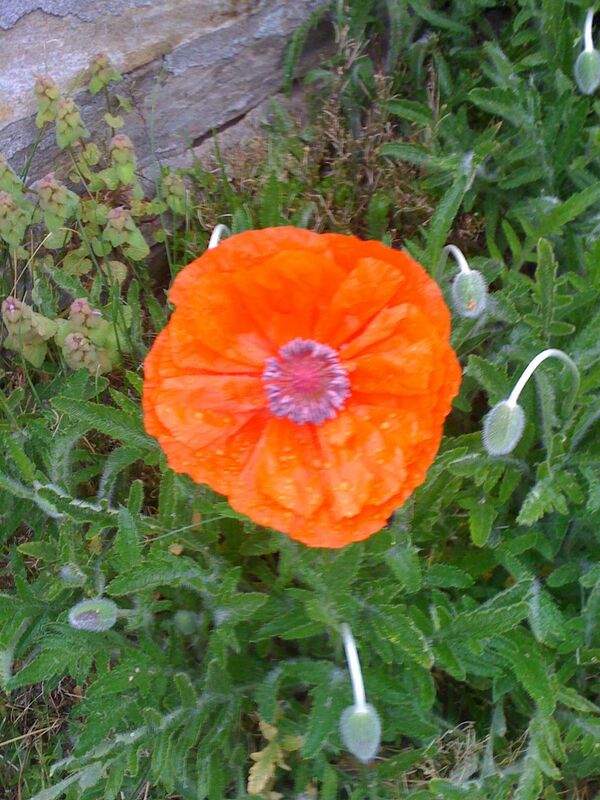 I love poppies, they are my state flower after all. nice post. I too love May Apples but I hear they are not to be eaten-not that I wanted to. How lucky are you to have such a great place to walk? That last pictures is so funny. What a great idea to take pictures of what you see on a morning walk. Can’t say mind would be as beautiful as yours. The only thing I’m afraid of walking into is a squirrel – maybe a raccoon on an extremely “wild” day. Wonderful surroundings for your morning walk. I would love to walk with yoooou!!! Pretty pictures!! Pretty place to live!!! 🙂 miss u! What a gorgeous walking route. I’d have no problem waking up in the morning to all that loveliness. I love your perspective on the sites, but you scared me with talk about a bear! Be careful out there! What a lovely walking route, right up until the bear of course! Enjoy the peacefulness! OMG, you really have bears near your house! Gawd! I am still freaking about having moved to a country where they have snakes and big spiders (no snakes at all in NZ). Touch wood I have seen either yet, but when I do, I think I’ll want to move back home, haha. I haven’t even seen a cockroach till I moved to Australia. Ewww they gross me out! ha, love the flowers in time out! Again, you live in such a beautiful area, we have no prettiness in dallas, just brown, brown, brown. Ha ha is it bad I thought “those poppies look like they’re in time out?” before I read what you wrote? Love it. And please don’t get eaten by a bear, we would all miss you a lot. I dunno- I think it’s funny- it’s crazy how these old pieces stick around and where they end up!